This years first elliptical halo was seen on 4. February by Mika Aho in Muurame. The picture here shows fuzzy upper part of the ellipse on the edge of Altocumulus cloud. Elliptical halos occur very close to the glare of sun and thus are not seen by accident – one has to look for them. They are often also short in duration. Appearances lasting less than a minute are not uncommon. Because of closeness of the sun, dark glasses helps spotting elliptical halos. It also helps to know some clouds, since elliptical halos are usually formed in vicinity of Altocumulus. These clouds are made of supercooled water droplets at around -15° C but sometimes they precipitate ice crystals. 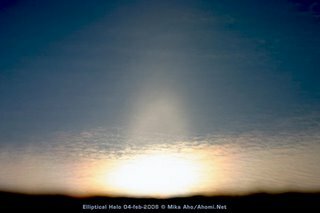 It is in this icy virga that elliptical halos are observed (the white thin cloud in Aho photo). Mostly, though, Altoclumulus virga produces no elliptical halos. Certain level of dedicated sky watching helps to succeed in seeing them. See more photos of the display and another ellipse last summer by Aho. Mika, very nice photos! Elliptical halo, sundogs and corona! Super. Mika, will your photos of new observation of Lowitz arcs online? Patrik, that Lowitz arcs observation was my mistake. I thought there was that arc but now it seems like there wasn't.